Sickle cell anemia can be diagnosed at any point of time during a person’s life. However, an early diagnosis is important to manage the condition effectively through proper sickle cell anemia treatment and care. A specific blood test is carried out as part of sickle cell anemia diagnosis, to detect if an individual has the disease or is a carrier of the sickle cell trait. Blood tests like Hb evaluation and DNA analysis are carried out as part of sickle cell anemia diagnosis. There are different kinds of blood tests used to detect hemoglobin S, an abnormal form of hemoglobin that is characteristically found in people with sickle cell anemia symptoms. Here are some of the tests that are commonly conducted as part of sickle cell anemia diagnosis. 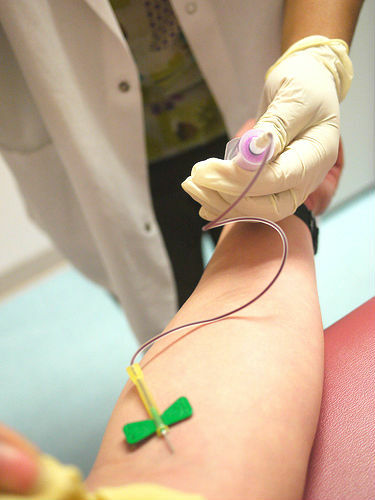 This test is used to screen for hemoglobin S in adults. A particular chemical is added to a blood sample taken from the subject, to reduce the amount of oxygen in the blood sample. If the subject has a sickle cell defective gene, sickle-shaped cells are formed in the blood due to the reduction of oxygen. It is not advisable to conduct this test on newborns, because until they are almost a year old, there will only be a production of hemoglobin F in the blood, and not hemoglobin S. If this test is performed in infants, there is a possibility of false negative results. This test is performed in order to check and measure the total number of abnormal hemoglobin cells in the blood. The most common methods used to carry out this test are Hb electrophoresis, Hemoglobin fractionation by HPLC method, and isoelectric focusing. In countries like the United States of America, it is mandatory to screen all newborn children for autoimmune disorders. By using the Hb isoelectric method, the abnormal hemoglobin S is screened. If there is a presence of abnormal sickle cells, then a second test is advised to confirm the results of the screening test. This helps determine if the child is a carrier of the sickle cell anemia trait or has a sickle cell disease. This test is commonly used to detect the defective gene that is responsible for producing hemoglobin S. It is also used to determine if an individual has only one defective gene (sickle cell anemia trait) or two. If both the genes are defective, it indicates a case of sickle cell anemia. DNA Analysis is usually carried out for unborn children, if one or both the parents have been diagnosed with sickle cell anemia or are carriers of the sickle cell anemia trait. A sample of the amniotic fluid (which contains the genetic material) that surrounds the unborn child is taken for DNA testing. In some cases, a chorionic villus sample (sample from the placenta) is taken for testing. This test is usually carried out at 14 to 16 weeks of pregnancy. If you or your spouse is a carrier of the sickle cell trait, your child could acquire the defective gene from either of you, as this is what causes sickle cell anemia. Consult a doctor for sickle cell anemia diagnosis if you’re planning a family. In any case, an early diagnosis is recommended for this condition to ensure timely treatment. This entry was posted in Sickle Cell Anemia and tagged diagnosis of sickle cell anemia, diagnosis sickle cell anemia by Dr. Smitha Rame Gowda. Bookmark the permalink.